Spring has sprung! Let’s eat and drink to it with a homemade hanami bento. KS finds out what’s in the best boxes. It all began with the emperors. During the eighth century, the Japanese aristocracy held plum blossom viewing parties in the Nara area. Later, when the capital moved to Kyoto, people started gathering to appreciate the much larger cherry trees. Although now one of the most popular trees in Japan, cherry trees were not always so ubiquitous. It was after the capital was moved, once again, to Tokyo that the eighth shogun commanded the widespread planting of cherry trees and encouraged the common people to turn out in springtime for hanami. He must have done a good job of it, because still now, in mid-spring, any park throughout the archipelago boasting cherry trees becomes a sea of blue tarps laid out for picnic goers. It surely is not just the will of the shogun that has kept this tradition alive. Makiko Itoh is a native of Tokyo who authors the blog Just Bento(www.justbento.com)and whose writing about Japanese food has been featured in magazines such as Saveur and Gourmet. When I ask her what keeps hanami so popular in Japan, she tells me: “The changing of the seasons is a central part of the Japanese consciousness.” Ohanami is one of the events that celebrates this. “It’s a picnic with a purpose,” she says. Modern-day hanami can be anything from a com-pany outing to a romantic date. Hanami has become so much a part of the yearly cycle of life in Japan that it has made some enduring additions to the culture. One is the expression, hanna yori dango(dumplings over blossoms). It can have different interpretations, but often refers to someone who is more interested in the food and drink at a hanami than in viewing the cherry blossoms. I’d have to say that’s me. When I attend a hanami the most important question is always, “What shall we eat?” At many of the more popular spots you’ll find food vendors and even makeshift restaurants, but bringing your own spread is much more in the spirit. For this, a bento is just the thing. So, what should you pack in your hanami bento? For starters, there’s the eponymous confection – hanami dango– comprising three to four mochi “dumplings” colored pink, white, and green, skewered on a stick. The first two colours represent the blossoms, while the green is for leaves of the cherry tree. Other wagashi(traditional Japanese sweets) in these colors are often included in bento. Sakura mochi, a larger portion of mochi tinted pink and wrapped with a genuine pickled cherry leaf, is a popular addition. On what to include in the hanami bento, Itoh explains: “Although many wagashi are tied to a specific season, no individual item is absolutely required.’’ In fact, a walk through the basement of most department stores at this time of year will demonstrate that the edible part of hanami is still evolving. While the motif of cherry tree colors can also be extended to foods other than sweets – boiled shrimp, green shiso leaves, and pink umeboshi (pickled apricot) to name just a few – there is no for-mula for the perfect hanami bento. A more practical guide is to choose foods that go well with the drinks for the occasion. The overwhelming majority of hanami are drinking parties. Sake and shochuhave been the drinks of choice since the Edo period, but recently beer, wine, and even cocktails have started to appear. And the blossoms themselves can be part of the hanami beverages. One or two salt-preserved cherry blossoms, added to warmed sake, tea, or just hot water, make a befitting accent on a chilly day. Those who want to drink in style should also note the recent development of artisan sake. Although a bit more pricey, these brews are made from 100% rice and have all the intrigue and subtlety of fine European wines. Hanami also provides the perfect opportunity for Izakaya-style dining, where drinks and a variety of small dishes can be shared among friends. Karaage and edamameare popular choices. Itoh recommends makizushi rolls or chirashizushi(sushi rice mixed with vegetables, seafood, and egg). The most fundamental thing is to remember that hanami is a celebration of spring, so Itoh suggests including vegetables such as bamboo shoots, nanohana(canola), or mountain vegetables for a taste of the season. 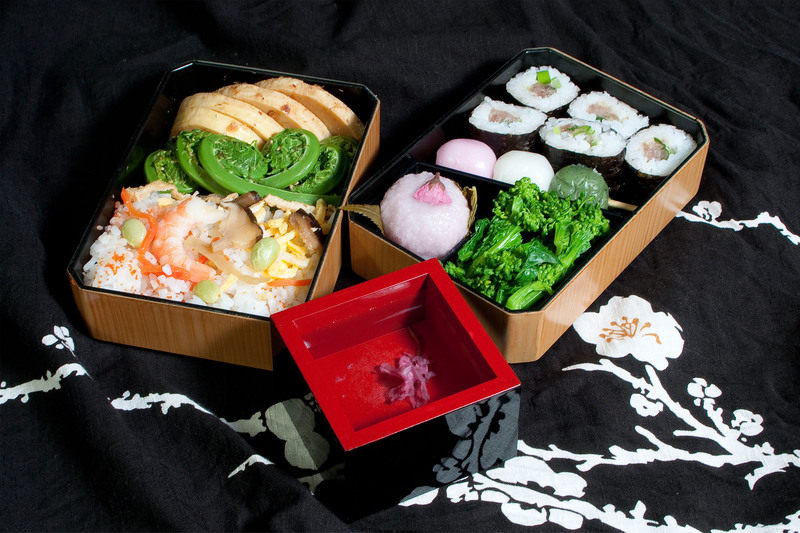 A hanami bento can be as elegant or as simple as you choose. A night-time picnic under illuminated blossoms could be a great opportunity to show off your culinary skill. But on the other hand, your bento could comprise the simplest of Japanese away-from-home food: a few onigiri and a jug of green tea.